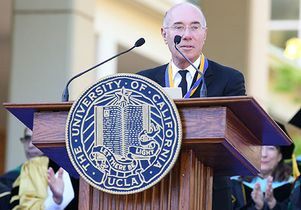 David Geffen, creator of the highly successful Asylum and Geffen record labels and co-founder of DreamWorks SKG, received UCLA’s highest honor, the UCLA Medal, from Chancellor Gene Block during the David Geffen School of Medicine’s Hippocratic Oath Ceremony held in Perloff Quad. 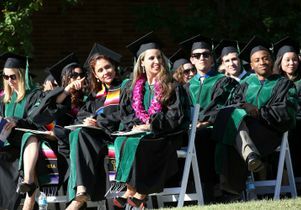 Presiding over the ceremony was Dr. A. Eugene Washington, dean of the David Geffen School of Medicine at UCLA and vice chancellor of health sciences. University of California Regent Sherry Lansing, founder of the Sherry Lansing Foundation and former chairwoman and CEO of Paramount Pictures' Motion Picture Group, also attended. To prolonged applause and cheers, Geffen talked about his “magical odyssey in Oz,” referring to Los Angeles, the beginning of his career as a nurturer of talent in music and movies, and the important role UCLA played in those early days. In 1995, Geffen donated $10 million toward UCLA’s Westwood Playhouse, which was renamed the Geffen Playhouse. Then in 2002, he made a $200 million unrestricted gift to UCLA’s medical school — the largest ever given to UC and to UCLA. At the time, it was the largest single donation ever made to a U.S. medical school and helped elevate the David Geffen School of Medicine at UCLA to a world-class institution for education and research. A decade later, in 2012, the philanthropist established the $100 million merit-based David Geffen Medical Scholarships. These scholarships cover the entire cost of a medical education for nearly 20 percent of entering students. The gift — unprecedented in medical school history — has impacted medical education nationwide by inspiring other medical schools to increase financial support for their students. The UCLA Medal is bestowed on those with exceptionally distinguished academic and professional achievement whose bodies of work or contributions to society illustrate the highest ideals of UCLA. Recipients have included national and international leaders in government, education, science, industry and the arts. Previous recipients include Nobel laureates, President Bill Clinton, UCLA alumnus and Los Angeles Mayor Tom Bradley, basketball coach John Wooden, U.S. Supreme Court Justice Harry Blackmun, and UCLA alumnus and astronaut Anna L. Fisher.